This is a link to a Google 3D SketchUp drawing for a great workbench which is very sturdy and easy to make! Built out of 2×4 and plywood/MDF it is also very affordable. You will need the SketchUp software to download this drawing and its freely available online. We do not provide support for this software. This is a link to a Google 3D SketchUp drawing for a rolling worktable with flip-up shelf and retractable casters. You will need the SketchUp software to download this drawing and its freely available online. We do not provide support for this software. This is a link to a Google 3D SketchUp drawing for a roll-around shop cart with two drawers, an open shelf, and a cubby on the back. You will need the SketchUp software to download this drawing and its freely available online. A Free Router Table Cabinet SketchUp Design by Ryno101. This is a link to a Google 3D SketchUp drawing for a router table cabinet. In incorporates standard router components. You will need the SketchUp software to download this drawing and its freely available online. A Router Table Cabinet SketchUp Design by Mike. This is a link to a Google 3D SketchUp drawing for a router table and cabinet made from birch plywood, edged with hardwood. Joints are simple dados. You will need the SketchUp software to download this drawing and its freely available online. Build a Router Table Station with SketchUp Design. This is a link to a Google 3D SketchUp drawing for a router table station which has a 24×48 inch table, Incra channels and 4 inch casters. You will need the SketchUp software to download this drawing and its freely available online. This is a link to a Google 3D SketchUp drawing for a sawhorse that is heavier than most, but sometimes heavy is good and it allows for the saw horses to be spaced closely for storage. You will need the SketchUp software to download this drawing and its freely available online. We do not provide support for this software. This is a link to a Google 3D SketchUp drawing for a portable router table that is clamped onto a workbench, and is easy to store. You will need the SketchUp software to download this drawing and its freely available online. We do not provide support for this software. Woodsmith Router Table SketchUp Plans. This is a link to a Google 3D SketchUp drawing for a router table. It was featured in Woodsmith Magazine 1982. You will need the SketchUp software to download this drawing and its freely available online. 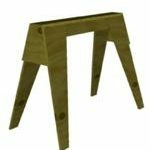 This is a link to a Google 3D SketchUp drawing for an easy to build sawhorse. You will need the SketchUp software to download this drawing and its freely available online.